It is arguably the most recognized artistic interpretation of the Last Supper, and it remains the subject of theory and conjecture. Are there hidden meanings in the composition? 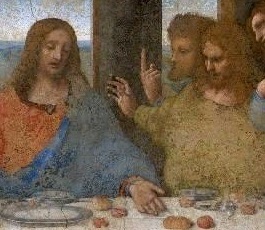 Most recently Ross King has suggested that Leonardo included self-portraits among the disciples, making himself both James the Less and Thomas. The identification of figures is based on a drawing in The Notebooks of Leonardo da Vinci. The disciples are (from left): Bartholomew, James the Less, Andrew, Judas, Peter, John, Christ, Thomas, James the Greater, Philip, Matthew, Thaddeus, Simon. That makes Thomas the face closest to Jesus (though James' hand is closer to Jesus). Does it look like a face that should only be known as a doubter? Which exact moment is depicted is no more certain than the potential meanings of the painting, but whatever moment it is, there is much energy around the table. Disciples jump to their feet and gesture. They look at one another and at Jesus. Thomas is, like the other disciples, astounded. He looks at Jesus with his right index finger pointing directly up. Perhaps he is objecting. Perhaps he is preparing to make a point or present a protest. One "restorer" along the way turned that raised finger into a loaf of bread(!). Whatever the statement, he is making it quite vigorously, and it is more effective to raise a finger than to wave a loaf of bread in the direction of our Lord and Savior. 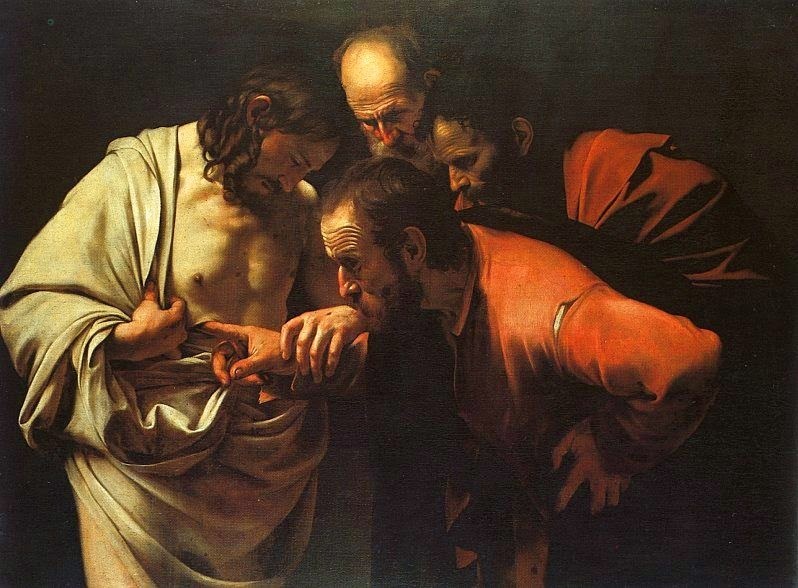 Visually there is a link between that raised finger and the finger placed in the wound in Jesus' side in Caravaggio's The Incredutlity of St. Thomas (below). The paintings were created almost 100 years apart, with the Caravaggio a century later. If there is copying going on, it is Caravaggio copying Leonardo. 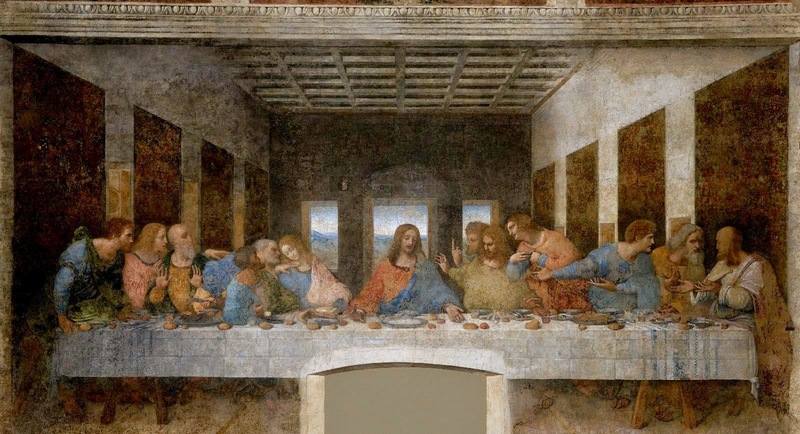 In Ross King's book, Leonardo and the Last Supper, he suggests that of all the disciples, Thomas might be the disciple who would appeal most to Leonardo the inventor, the experimenter, the scientist, the engineer. Leonardo was not content with other people's answers. He wanted to know things for himself. Though we mostly remember Thomas from the Easter 2B passage in John's gospel (20:19-31), he was a member of the band of disciples who were with Jesus throughout his ministry and as such he will be shown with them. Perhaps looking at those would help give us a fuller picture of the man so many people are content to identify by a single broad adjective. 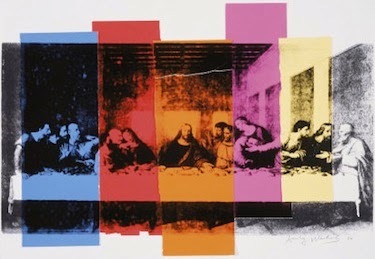 See what happens to Thomas when Andy Warhol gets hold of Leonardo's painting. 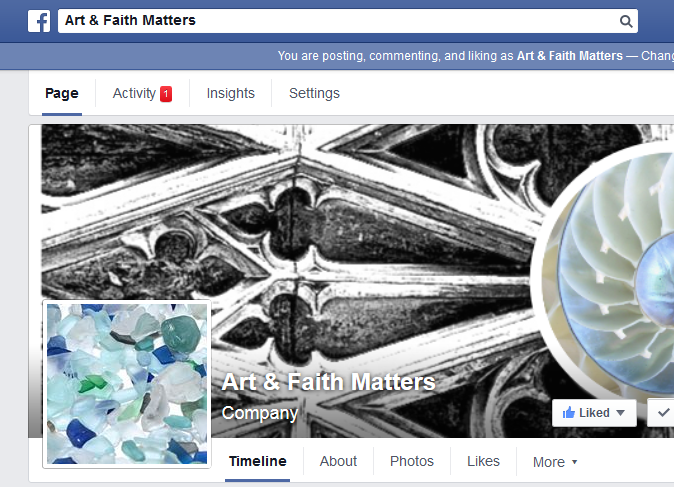 Click on the Art&Faith Matters Facebook link. For additional thoughts about Thomas (John 20:19-31), click here or here. For thoughts on Acts 4:32-35, click here.